The 2018 Wellington Festival has drawn to close after a day of action-packed rugby involving English rugby’s 14 regional academies. 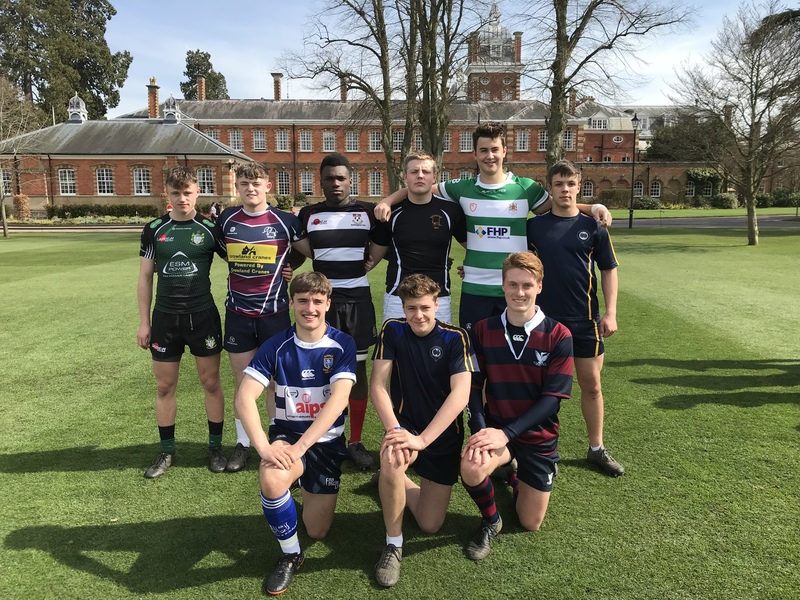 The week-long programme, held annually at Wellington College, Berkshire, aims to develop both academy players and coaches on and off the field in a variety of areas and featured a number of NLD U16 & Leicester Tigers Academy players. On the field, the academy teams trained and played against each other in a number of matches, challenged with law variations which encourage ball in play, skilful rugby. Off the field, players were also given education and guidance in nutrition, anti-doping and professional sports pressures. As well as game days on Tuesday and Saturday, players had the opportunity to meet head of England Sevens Simon Amor, as well as watch a sevens exhibition match. Referee Wayne Barnes also gave the players a presentation on officiating on Monday, while Thursday was National Coaching Day. Players were immersed in skill zones and masterclasses throughout the week. Central to this was CARDS (creativity, awareness, resilience, decision making and self-organisation) – the pathway priority skills for helping develop the next generation of England Rugby players both on and off the pitch. 14 Premiership Rugby Academies: Bath Rugby, Bristol Rugby, Exeter Chiefs, Gloucester Rugby, Harlequins, Leicester Tigers, London Irish, Newcastle Falcons, Northampton Saints, Sale Sharks, Saracens, Wasps, Worcester Warriors, Yorkshire Carnegie. NLD RFU Launch Youth Council! NLD RFU are delighted to announce the launch of the NLD Youth Council for the 2018-19 season and beyond! 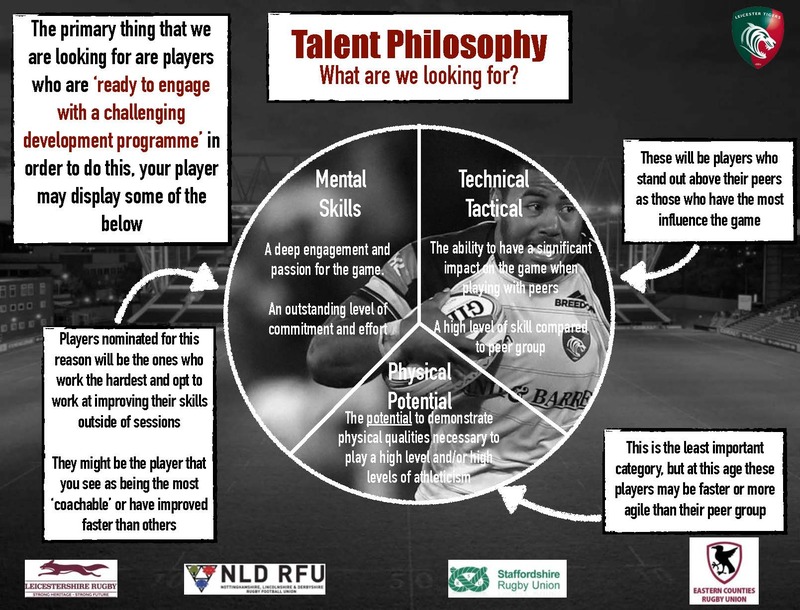 Mirroring the RFU National Youth Council this is a fantastic opportunity for young people, who are passionate about rugby, to get involved in shaping the way NLD RFU supports the 16-24 age group. What is the NLD Youth Council? We are looking to appoint a group of young people to form the NLD Youth Council for the 2018-19 and 2019-20 seasons (two year term of office). The successful applicants will be between 16-24 years of age and be passionate about developing the game within NLD while learning lots of new skills to develop both personally and professionally. You can read the job description in full by clicking here. What will you get out of becoming a member of the NLD Youth Council? Applications are now open to all young people from within aged 16-24 years of age! You can apply by completing the application form, click here. If you have a particular interest in certain roles on the Youth Council then you are able to indicate this on your application form as well. Please note that in order to be considered you must be available to attend the Recruitment Day on Saturday 30th June 2018. The closing date for applications is 30th April 2018. If you are under 18 years old, you will need your parent’s / guardian’s consent to apply. NLD are pleased to release the 2018-19 Age Grade Rugby Calendar which includes key dates for the Age Grade game next season. The calendar has been produced in discussion with a number of key stakeholders throughout NLD including the Heads of Competitive Rugby, Education, Representative Rugby, Women & Girls as well as Tigers Academy. The calendar sits fully within the RFU’s Age Grade Rugby framework and has been approved by the RFU for the coming season. Please share this information within your clubs and institutions and encourage dialogue with each other in the next couple of months to get well ahead of any potential conflicts for next season. The Calendar particularly aids planning for players who play in more than one environment. Block or friendly fixtures can be played throughout any part of the season and the Calendar signals how player availability for these will be affected by other activities. If you have any queries regarding the calendar then please do not hesitate to get in touch and we will be happy to help you. Leicester Tigers are now inviting nominations for U13’s in the Developing Player Programme. Please see all details of the nomination process below, if you have not received the nomination forms then please email [email protected]. The closing date for nominations is 29th January 2018. The Leicester Tigers Developing Player Programme currently has some Coaching Opportunities available. For more information and details on how to apply please click here. Nominations are now invited for the DPP U13 Programme being run by Leicester Tigers. For more information and details please click here. 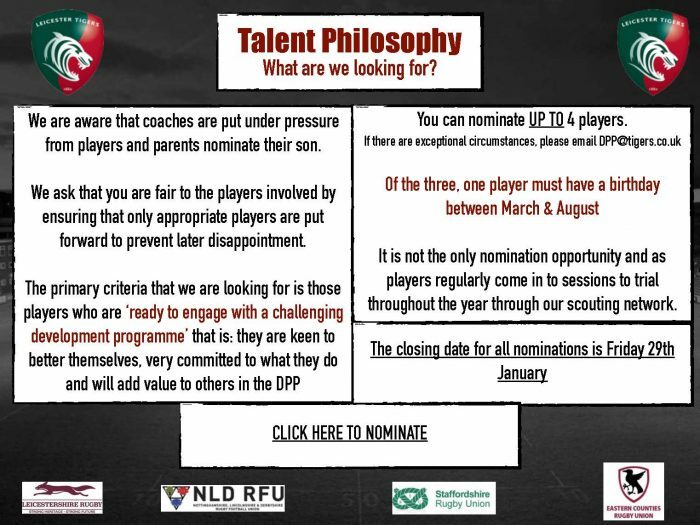 To nominate your players please click here. 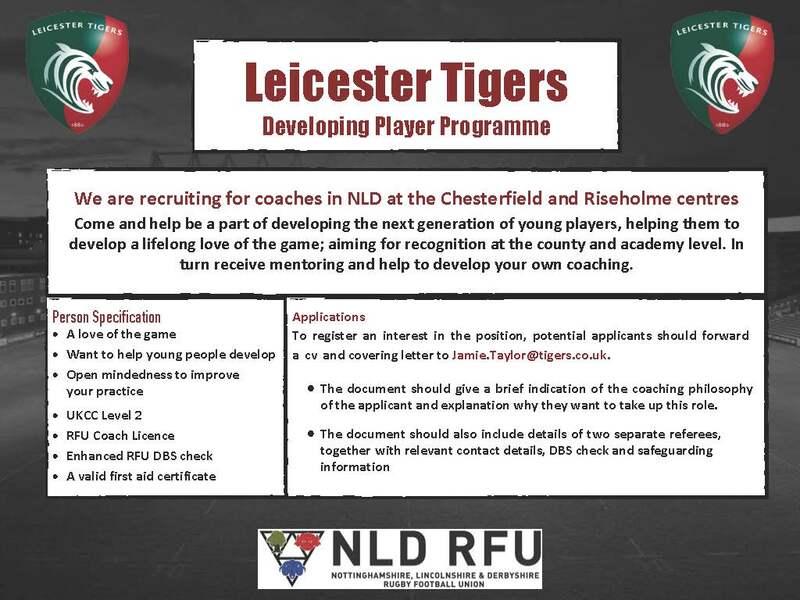 Leicester Tigers are currently looking to appoint coaches for both the Developing Player Programme & EPDG. More information on all of the roles, including details of the application closing dates are available below. Age Grade Rugby Roadshow – Watch Now! Last night saw the RFU Age Grade Rugby Roadshow visit NLD as they visited Mansfield RFC. The evening was a fantastic success with over 60 attendees from clubs throughout the region. Mark Saltmarsh, Head of Education for the RFU, along with his team, offered a fantastic insight into the changes coming to Age Grade Rugby from the start of the 2016-17 season. More information on all of the changes can be found by visiting the Age Grade Rugby website. The roadshow continues over the coming weeks, for a full calendar of events, click here. The meeting was also streamed live on the England Rugby YouTube page and people were able to tweet in their questions using #agegraderugby. The meeting is now available to view at your leisure below. 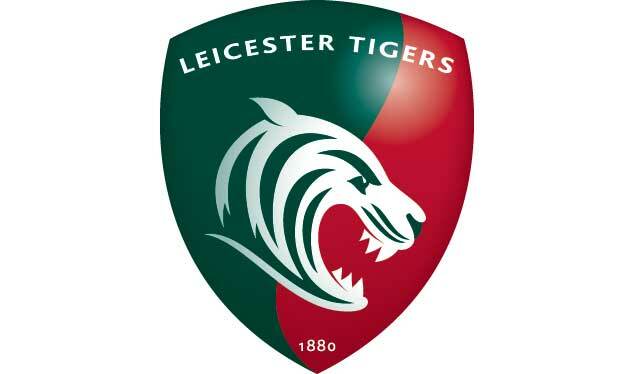 Leicester Tigers Academy are holding a Stakeholder forum on Saturday 30th January at Oval Park. The meeting will consist of a short presentation by Dave Wilks Academy Manager on the current Academy systems an plans for the future of the Academy. 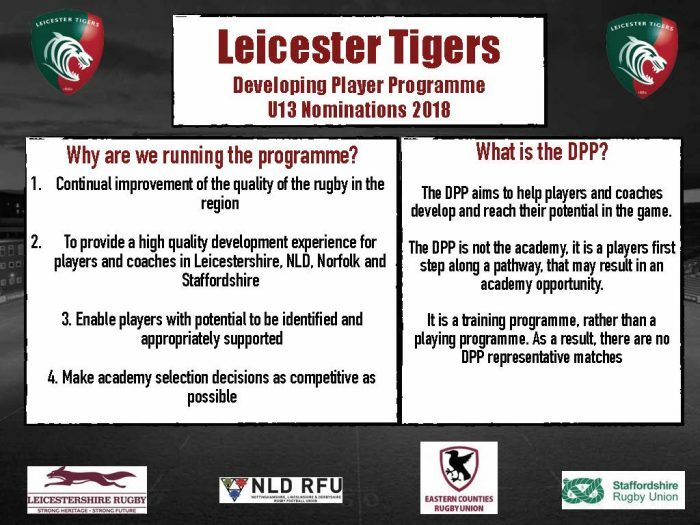 There will be an opportunity to ask questions and an informal discussion of any regional rugby matters before watching the Academy U18 game; Leicester Tigers V Newcastle, 12pm KO. The meeting will start at 10.30 am the venue is Oval Park Training Ground, Wigston Road, Oadby, Leicester, LE2 5QG. Please feel free to circulate to other Stakeholders in the Academy System. If you would like to attend please reply to [email protected] to confirm your place.